Interviewer: Let’s talk about how this landscaping process is unique. I know that landscape design is a big part of it. What is your usual design process? Laura: Typically the homeowner will contact us and give us a brief synopsis of what they are looking for. If it sounds like something that we could be of assistance to them with, then we normally recommend for us to schedule a meeting with them on site. Prior to that meeting we’ll send out a design questionnaire, and it’s about 8 or 9 pages. It touches on just about everything – what they like about their property now, what they don’t like, what they want to change, budget parameters, style, plants that they love. This helps to get the homeowners to start thinking about elements or features they want to be able to include into their landscape. Once we get to the initial meeting we look at the questionnaire we sent to them ahead of time and then walk around the property. We ask the homeowners show us the areas they have in mind and walk us through what they’re envisioning in their heads. As we’re walking the property we might make suggestions or throw out ideas they hadn’t already thought of for certain areas of their landscape. Then typically once we’re done we’ll go inside and recap the design questionnaire. I’ll ask a few more questions on anything that I think needs a little bit more clarity. And then we’ll show them our tablet that’s got a lot of photos of work we’ve done. I like to use that as a gauge to see what they seem to like as far a look or certain materials. If they indicate they really like a photo I will ask them about why they like it. That helps to narrow down what they’re envisioning for their landscape project. Then from there once they decide they want to move forward with us, we have our base mapping crew go back out to the site and do field measurements. We’ll take measurements of doors and windows, we’ll take sight lines from inside the house looking out, and we’ll make notes of any existing features that will be staying. Once we get done with field measurements we will also take elevation measurements if we need to. From there we get started on the design. Normally we try to start with the hardscaping, like driveways, walkways, patios, pool decking, that kind of thing. Once we have that all set in a way that fits with how the homeowners want to utilize their space and the overall functionality and flow, from there we’ll get started on the softscaping, which is the bed lines, the plants, and the rest of the living things that go into a landscape design. Interviewer: So if someone wants a pergola, that would be included more in the hardscaping phase? Laura: Yes. Normally we start with patio pavers or other flat work first, and then we add in things like pergolas, the outdoor kitchens, pavilions, water features – that’s all kind of part of hardscaping. Those are the bigger pieces we need to configure into our overall layout. Interviewer: I imagine the location of all those elements is important. Do you ever work with homeowners who have done their own landscaping but realize they need some help to make it better? Laura: All the time! And we realize with these projects we need to tread lightly because when the homeowners do it they have sweat equity in it and you don’t want to hurt somebody’s feelings. We’re very understanding, since often they haven’t had access to what they’ve needed to do it right. For example, if they’re trying to tackle hardscapes, they don’t have the equipment in order to get it done the way that it needs to. People love to look at the ‘after’ pictures but they don’t realize all the work that goes into doing it and all the equipment that is necessary to put patios and walkways together. We use skid loaders and we have to excavate down deep sometimes. We use large compactors and bring in a class 2 base in two- to three-inch increments and compact that down. Then we bring in more. People may not realize there is a lot of time that goes into putting patios and other hardscapes together. It’s not just grabbing a shovel and a wheelbarrow, thinking that you’re going to put in a gorgeous patio that’s going to last longer than a couple months. The unfortunate thing is that I think the homeowners think that they can tackle it, and then when they get done with it but in two or three months you get ants that are bringing sand up. Instead of looking at the construction end of it and how it was constructed and realizing that they might have made a mistake, they typically tend to blame the pavers, that it’s a bad system. It’s not a bad system; it was just installed inappropriately. When it comes to flower beds, a lot of times we’ll find that homeowners love to walk up and down the aisles in garden centers. What typically happens is they’ll see a pretty flower that’s blooming at that particular moment, so they take one of those, and then they walk down three more aisles and see something else that’s blooming and say, ‘Oh, that’s really cute; I’d like to have one of those,” and so they grab one. By the time they get home and put them in they’ve got 12 different varieties of all different plants and there is no consistency or flow between the plant materials. It makes more sense to plant in bigger drifts of the same plant materials than it does to get one of these, and one of these, and one of those, and one of that. So I think it’s about being consistent and carrying the same theme through the landscape – from the front yard into the back yard. Interviewer: Do you charge a fee for the initial consultation? Laura: No, our initial site visit and meeting with the homeowner is free of charge. That’s a good way for us to meet the homeowner, show them what we’re capable of doing, and seeing if it’s a good fit for us to be working with them and for them to be working with us. So we do not charge anything for that initial site visit. Interviewer: What do you love the most about designing home landscapes? Laura: I love the reaction we get from the homeowners when we’re done. And I love the interaction with the homeowners during a project. We had just finished up a project in Maple Grove. The wife was a stay-at-home mom with little ones, and one of her little ones was about 3 years old. He had his face up against the glass during the entire process. He was out there saying hi to the guys every morning. He was thrilled with all the machinery. And I love the long-term relationships we build with our clients. We’re landscapers, but most importantly, we’re in the relationship building business. We just happen to do landscaping. Interviewer: Can you point to something you feel that makes Architectural Landscape Design different from other landscaping companies in the Minneapolis area? 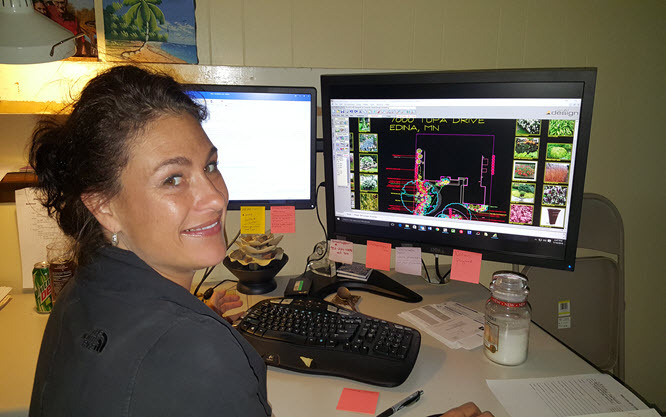 Laura: I believe we excel at designing outdoor areas that are balanced between the various elements. Most landscape companies are very good at the hardscaping or they are very good at the softscaping, but very rarely do you find a company that is good at both. If you are too heavy in one or the other, something just is off. You can’t always put your finger on exactly what; it just feels a little bit off. It’s a fine balance between the hardscaping and the softscaping. They definitely need to complement each other. You can’t be too heavy in one or the other. And I believe that’s one of the advantages we have to offer our customers. We work hard to find creative landscaping solutions that have that fine balance.